Serious infringements during a football match are punished by the showing the player a yellow card. When two football players who both want to win the ball collide, one player may be reckless, making an injury more likely for the other, or use excessive physical force. Also, players may try to gain an unfair advantage for their team by misconduct, including dissent to referees or by purposely delaying play. A single yellow card does not trigger a sanction during the match, but it goes on the player’s disciplinary record. This may have additional consequences for persistent offenders. For example, in the English Premier League, if a player receives five yellow cards between the start of the season in August and 31 December, he is suspended for the game that follows the fifth card. If he accumulates a total of ten yellow cards before the second Sunday in April, he is suspended for the two games that follow the tenth card. Should he receive 15 cards before the end of the season, it triggers an immediate three-game suspension. The availability of detailed statistics in football has allowed researchers to study the impact of cards on the outcome of a match (Ridder et al. 1994, Bar-Eli et al. 2006) and the factors that affect the team’s probability of receiving cards (del Corral et al. 2010). In our recent research (VanDerwerken et al. 2016), we use match-level statistics by player from the 2011-2012 season of the Premier League to investigate the impact of the suspension rule on the fouling behaviour of players. We investigate whether players commit fewer fouls as they approach the suspension limit, whether players that are close to the suspension limit are less likely to receive a yellow card, and how the number of fouls committed would differ if the suspension rules did not exist. We answer the first two questions using common econometric techniques, and we develop a structural model of optimal yellow cards accumulation to tackle the last question. Variants of the Premier League’s suspension system are used in many football tournaments. All are delayed punishment schemes, similar to the ‘three strikes’ legislation in some US states that imposes harsh punishments on persistent offenders (Greenwood et al. 1994, Zimring et al. 1999). To analyse the effect of such a system on the behaviour of an individual, it is important (Shepherd 2002) not only to measure the decline in criminal activity of individuals with two strikes. If we do this we underestimate the true impact of the legislation, because all potential offenders may change their behaviour. In our case, the mere existence of suspension rules deters aggressive play even in the first game, because players do not want to get close to the suspension limit. We first examine empirically the effect of yellow card accumulation on the number of fouls committed under the current Premier League suspension system. We use Poisson regression1 to predict the number of fouls, controlling for other variables which are suspected to influence fouling to isolate the effect of penalty card accumulation. For instance, we include a fixed effect for player, which incorporates attributes such as inherent aggression level, position, and athleticism. We also include match-level performance variables such as the numbers of interceptions, tackles won, and unsuccessful dribbles. Finally, we controlled for time until accumulation deadline, venue (home or away), severity of suspension faced, and the difference in score at the end of the game. Correcting for all these potential influencers, accumulating more yellow cards reduced fouling, as expected. When a player was one yellow card away from a one-game suspension, he fouled about 12% less than he would have done if he were two yellows away, and 33% less than he would have done if he were five cards away (for example, at the start of the season). The decline in the number of fouls was larger when a player faced a two-game suspension. 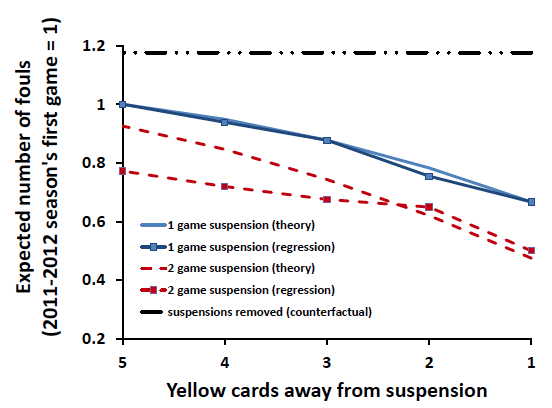 Figure 1, below, shows the estimated expected number of fouls as a function of yellow cards away from suspension. How much more would players have fouled if the suspension rules did not exist? A naive way to answer this question would be to calculate an expected number of fouls committed by a player who has not yet accumulated any yellow cards during the season, and treat it as an expected number of fouls per player for every game. This ignores the Lucas Critique (Lucas 1976). Our estimates were obtained in an environment with suspension rules. In this environment, players may foul less even in the first game of the season, because an early yellow card increases the probability of being suspended later. We developed a structural, dynamic model of optimal yellow cards accumulation to address this ‘fear of first strike’ (Shepherd 2002). The model is a standard dynamic programming problem with the following features. The number of yellow cards accumulated is the state variable. A player chooses his effort at the beginning of the game. Higher effort increases the probability of his team winning the game. It also increases the probability of getting a yellow card. In equilibrium, a player must balance this trade-off, knowing that five yellow cards results in a suspension. The model relies on several parameters, some of which can be calibrated from our data, and some of which cannot. For those we can calibrate, we ensure that the decrease in the number of fouls associated with the player approaching the threshold of five yellow cards is the same in the model as it is in the data. Other parameter values have to be imposed ad hoc. We then run a counterfactual experiment by removing the suspension rules from the model. In the experiment the players know that a single yellow card in one game has no impact on future suspensions, and they do not need to adjust their play in the early games. Using our chosen parameter values, we find that the existence of Premier League suspension rules reduces expected number of fouls in the first game by about 15% (our estimate of the fear of first strike). Throughout the whole season, the suspension rule causes a 33% reduction in the expected number of fouls. Figure 1 also shows our theoretical model’s predictions of the expected number of fouls in a game committed by a player as a function of the number of yellow cards he is from suspension. This model allows us to analyse how factors such as referee strictness impact the effectiveness of suspension rules. If referees are too lenient, suspension rules do not have much bite, because the players know they are unlikely to be given a yellow card. If the referees are too harsh, suspension rules do not have much bite either – if even a mildly aggressive play yields a yellow card, a player might as well focus solely on the current game, since he is likely to receive a yellow card anyway. Increased availability of match-level statistics combined with simple economic theory made it possible to quantify the impact of suspension rules on aggressive play in football. On a more general level, we have learned how individuals respond to delayed punishments, which sheds light on research areas outside professional sports. Bar-Eli, M, G Tenenbaum and S Geister (2006), “Consequence of Players’ Dismissal in Professional Football: A Crisis-Related Analysis of Group-Size Effects”, Journal of Sport Sciences, 24:1083–1094. del Corral J, J Prieto-Rodriguez and R Simmons (2010), “The Effect of Incentives on Sabotage: The Case of Spanish Football”, Journal of the American Statistical Association, 11:243–260. Dawson, P, S Dobson, J Goddard and J Wilson (2007), “Are football referees really biased and inconsistent? Evidence on the incidence of disciplinary sanction in the English Premier League”, Journal of the Royal Statistical Society - Series A, 170(1):231–250. Greenwood, P, C Rydell, A Abrahamse, J Caulkins, J Chiesa, K Model and S Klein (1994), “Three Strikes and You’re Out: Estimated Benefits and Costs of California’s New Mandatory- Sentencing Law”, Technical Report MR-509-RC, RAND Corporation. Lucas, R (1976), “Econometric Policy Evaluation: A Critique”, Carnegie-Rochester Conference Series on Public Policy, 1(1):19–46. Nevill, A, N Balmer and A Williams (2002), “The influence of crowd noise and experience upon refereeing decisions in football”, Psychology of Sport and Exercise, 3(4):261–272. Ridder, G, J S Cramer and P Hopstaken (1994), “Down to Ten: Estimating the Effect of a Red Card in Football”, Journal of the American Statistical Association, 89:1124–1127. Shepherd, J (2002), “Fear of the First Strike: The Full Deterrent Effect of California’s Two and Three-Strikes Legislation”, Journal of Legal Studies, 31:159–201. VanDerwerken, D N, J Rothert and B M Nguelifack (2016), “Does the Threat of Suspension Curb Dangerous Behavior in Football? A Case Study From the Premier League”, Journal of Sports Economics, OnlineFirst. DOI:10.1177/1527002516674761. Zimring, F, S Kamin and G Hawkins (1999). Crime and Punishment in California: The Impact of Three Strikes and You’re Out. Institute of Government Studies Press, University of California, Berkeley. Poisson regression is similar to ordinary least squares, but the counts are assumed to follow a Poisson distribution instead of a Normal. As a byproduct of the analysis, we also found that playing at home versus away has a small but discernible effect on the probability of a penalty card. In our running scenario, playing at home reduces the player’s probability from 10% to 8%. Having corrected for suspected lurking variables, it seems reasonable to attribute most of this modest reduction to referee rather than player behaviour, which corroborates what other researchers have found (for example, Dawson et al. 2007 and Nevill et al. 2002).